This recipe is the one that, to me, proves even something as delicious as shrimp scampi can make a quick and easy weeknight meal. It’s fancy enough to serve at a dinner party but fast enough to whip up any time you find yourself with a craving for some buttery garlic decadence. I loved ordering garlic shrimp whenever I was by the coast in Ecuador and this is very similar to camarones al ajillo, although you’d be more likely to see cilantro in place of the parsley I use here. Rinse the shrimp and pat them dry. If you’re using frozen shrimp, make sure they are completely thawed; usually just a few minutes under running water does the trick. Melt two tablespoons of butter in a sauté pan over medium heat. Add the shrimp and cook until just turning opaque, approximately two minutes each side. 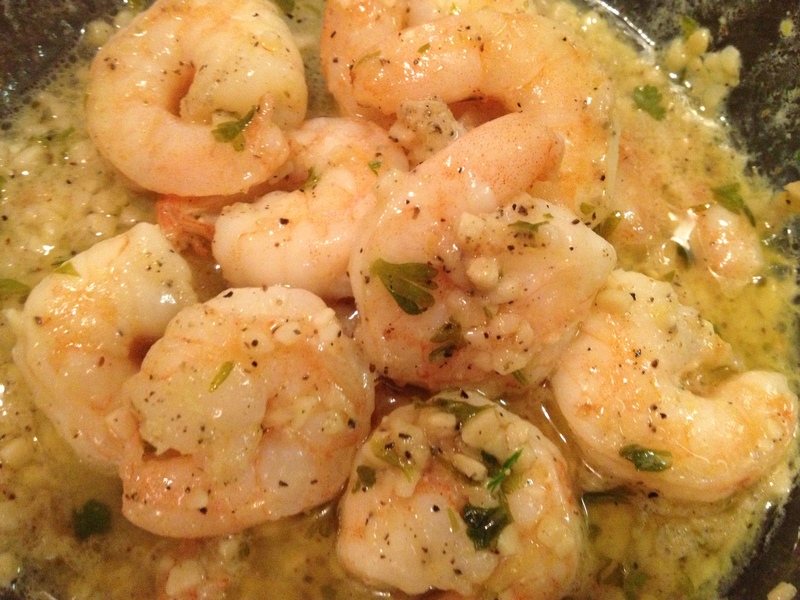 Set shrimp on a plate to the side and add the remaining four ounces of butter and the garlic to the pan and cook for about one minute until the garlic turns golden brown. Add the white wine allow to simmer about three minutes. At this point, taste the sauce to make sure the alcohol taste has cooked out and to adjust salt and pepper to taste. Then add the shrimp back to the pan and toss with the fresh garlic for about one minute. This can be served over pasta or rice, but we like to serve it alongside Spanish or Italian style tomato bread. We just halve a baguette or piece of Italian bread, drizzle with olive oil, and top with garlic, salt and pepper before bake at 350 degrees for about ten minutes until toasted. Once baked, we halve tomatoes and rub the cut side over the bread before cutting into one inch slices. The tomato bread compliments the scampi nicely and soaks up every last bit of that wonderful, garlicky, buttery sauce. 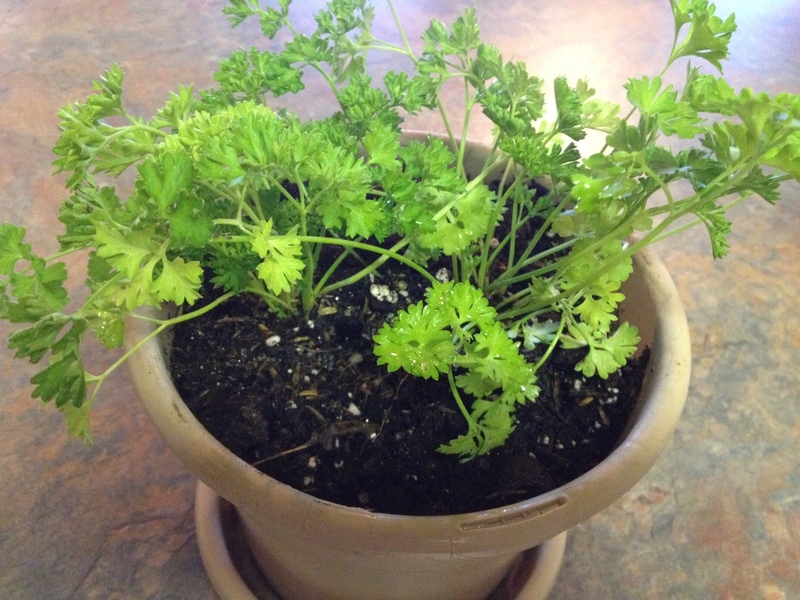 Parsley (curly or flat-leaf Italian) is a great way to add splash of brightness to a dish. As with most fresh herbs, it’s best to add it in the last minute or two of cooking or to sprinkle on top after the dish is plated. Though it’s usually associated with Italian dishes, I use it a lot in Latin American cooking as a replacement for cilantro. I’m not a big fan of cilantro but parsley makes a great substitute for the touch of herbal freshness without the bite of cilantro. This is another herb that grows well indoors or outdoors with lots of light and weekly watering, the main difference is that it’s best to harvest this herb from the bottom of the stem rather than the top like most other herbs. Such a simple but delicious dish. love it. Me too! It sounds so much more complicated than it is.